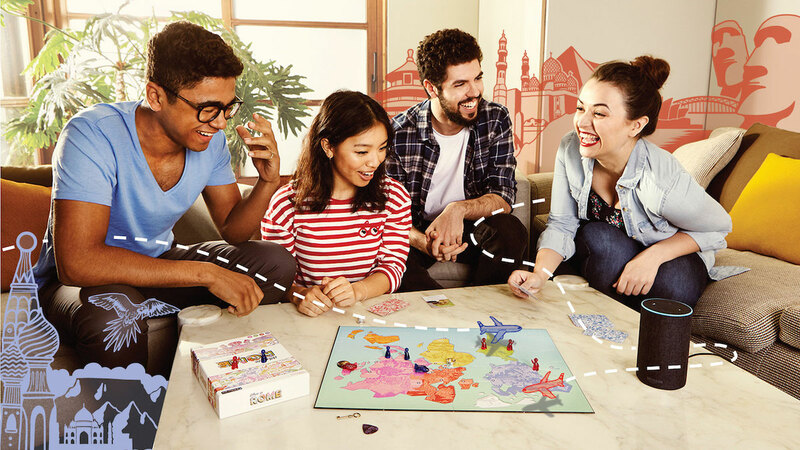 Combining a board game with the intelligence and voice of a smart speaker, ‘When in Rome’ is the first of a new genre. These games pair up with a smart speaker and as you play the speaker’s AI will act as your guide – teaching the rules, keeping track of your progress and even helping in times of trouble. ‘When in Rome’ currently works exclusively with the Amazon Echo, as it was prototyped as part of the inaugural class of Amazon’s Alexa Accelerator, Powered by Techstars. ‘When in Rome’ is from Sensible Object, the same creative minds that invented ‘Beasts of Balance’ the game that uses RFID-enabled pieces to engage the player. The original ‘Beasts of Balance’: ‘Beasts of Balance’ and Where to Find Them, GeekDad, February 16, 2016 and Reaping the Rewards: ‘Beasts of Balance’, GeekDad, December 13, 2016. And the update last year: Kickstarter Tabletop Alert: ‘Beasts of Balance: Battles’, GeekDad, July 16, 2017. This first edition of ‘When in Rome’ is a very family-friendly game, the developers compare the adventure to staying in Airbnb-type homes around the globe where you have a friendly local host to show you around. Future versions might include more mature releases, featuring local nightlife, music and festivals. Pre-order for ‘When In Rome’ is available now on Amazon for $29.99 and the game will be released on July 2, 2018. For more information, visit www.voiceoriginals.com/wheninrome.